The Intelect TranSport line of portable therapy products is equally as adept on the go as it is in the clinic. Each unit’s unique design allows it be to be used for tabletop, wall mount, therapy cart or mobile use. Its lightweight design, battery powered option and custom carrying bag allow you to conveniently take the clinic out of the clinic. 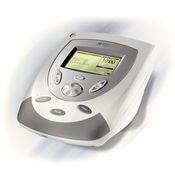 5cm² soundhead is included with the unit with the ability to provide electrotherapy treatment.